CLOSED FIELDSThey are closed halls for real / simulating fire training. Full security and fine decoration are considered: The. To protect against Bullets reflection, the armored steel sheets are covered with wooden coverage and rubber hanged strips to damp the bullets kinetic walls and ceiling are covered with armored steel sheets to protect against bullets penetration energy. 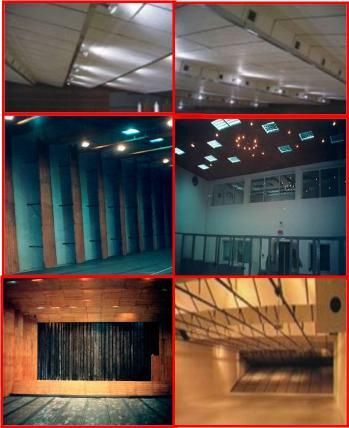 A complete sound isolation is carried out, for silence outside these halls.These halls are arranged with air-conditioning, ventilation and variable kinds of lighting simulating variable lighting conditions: day-sunset-night,..Besides, modern arrangement for monitoring, recording, analyzing shooting result are available. Walls and ceiling are covered with armored steel, then covered by decorative treated wood. The armoured steel sheets are fixed with special angles to prevent bullets reflection or changing their paths. Insulation Sheets of rocky wool layer between the field internal and external walls. The sheets are fixed on wooden squares, then covered by thin wooden sheets specially treated against sound, heat and humidityLighting System Different lights to simulate different light conditions (day-night-sun-set) using different kinds of lamps for these purposes. Air-conditioning and Ventilation The is equipped with air and ventilation systems to cover the field needs for cold air and getting ride of bullets smokeSecurity System The field is equipped with fire alarm system covering the whole area with electric power disconnection and fire brigad automat dialing in case of fireMonitoring and Control Room Through which all targets are controlled and it is allowing different training scenarios , equipped with PC control panels; communication system between trainer and shooters and recording declaring, analyzing of shooting result.Shooters CabinsIt is prefabricated armored walls equipped with places for weapon and bullets and communication system with the control room. Viewers HallEquipped with different screens to allow the viewers to follow-up the events inside the shooting field. It is equipped with security doors not to allow admission to shooting field. Bullets Traps Behind Targets Rubber strips hanged from ceiling and fixed with special angels with special specifications, to absorb bullets kinetic energy. Shooting Field Floor It is covered with wooden squares having suitable thickness fixed to the ground and water insulated with chemical substances then covered with wooden sheets, which in turn is covered with thick rubber layer resists fire and high temperatures.